a great day trip. . . The weather was so great on Saturday, we decided to take a family day-trip rather than work in the yard or run errands. 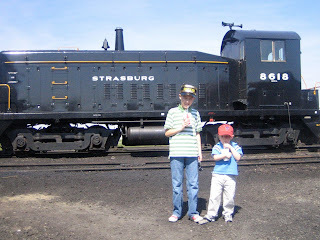 So we loaded up the diaper bag (for Owen for a bit longer), grabbed our sunglasses and headed out to Strasburg Railroad in Strasburg, PA. 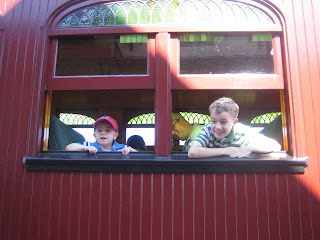 When Ryan was younger - we took him all the time to see the trains. Now that Owen is almost 3 1/2, we thought he would be able to enjoy the day. We were right. 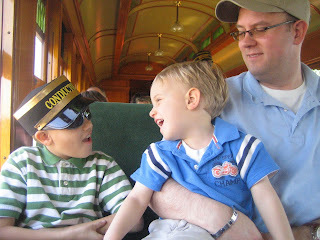 It happened that Saturday was their first day of the season - so there were only three train rides that day. We purchased our tickets online, and decided for only $1 more per ticket, we'd get the Coach Day Pass tickets, that allowed us to ride the Coach cars as many times as we wanted. We got there in time for the first ride of the day - and it didn't disappoint. The kids loved it - the scenery was beautiful and the fresh breeze blowing through the windows just screamed SPRING! The Conductors do a lovely job of telling you a bit of history and facts about the railroad in an amusing story-telling manner. So the trip is not only fun - it's educational! After the first ride, we grabbed a quick bite to eat at the small cafe there. You can also pack a picnic lunch - and eat there at the train yard, or get off the train at a picnic area and re-board the next train. Then we put our quarters on the tracks and had the second train riders flatten them into metal discs. We took our discs and jumped aboard the final ride of the day. Since it was the begining of the season - the little extras all around the area weren't operating yet - but they will be. 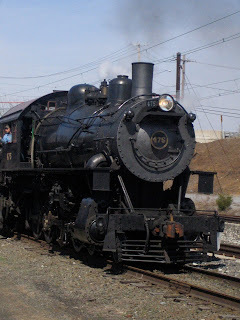 So if you're local to the area (or just visiting) - grab a nice day and head out to the trains.